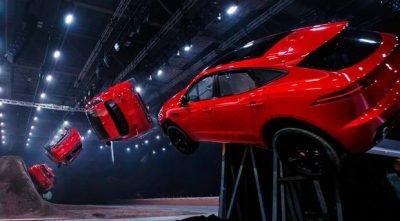 Jaguar’s new compact SUV got off to a record-breaking start with a 15.3m jump complete with a 270-degree corkscrew-like barrel roll in London last week. And the Tata-owned marque is hoping you too will be falling head over heels when the E-Pace is launched here later in the year. A baby brother to the F-Pace, it will go head-to-head with the likes of the Audi Q2/A3 and BMW X1/X3. Built on the same platform as the Range Rover Evoque, and sharing the same parts bin as the Land Rover Discovery, the new offering is boasting “incredible spaciousness onboard” compared to its rivals. Styling is a mix of the two Fs – the aforementioned SUV and the sleeker F-Type – with sweeping roofline, distinctive Jag grille, muscular panels, short overhangs and powerful haunches. Irish customers (according to the website) can choose three trims with the entry model coming with alloy wheels, LED lights, climate control, 10-inch Touch Pro infotainment system, parking sensors, lane assist and rear camera. Engine-wise, there’s either a 2.0 litre diesel with 150, 180 or 240bhp or a 240 or 300bhp petrol with FWD or AWD. Inside, the cabin offers Q5-like room with a boot that’s capable of swallowing 577 litres of luggage. There are no prices at the time of us going to print (the world launch takes place tomorrow) but a little bird tells us that it should start just shy of €35,000.